In a large bowl, combine first 6 ingredients. In a smaller bowl, whisk rest of ingredients. Mix together, and divide onto 2 greased baking sheets. Bake for an hour and a half, at 250º, stirring every 15 minutes. Cool and store in an air tight container. I was thinking it was like Donna’s baked oatmeal…. 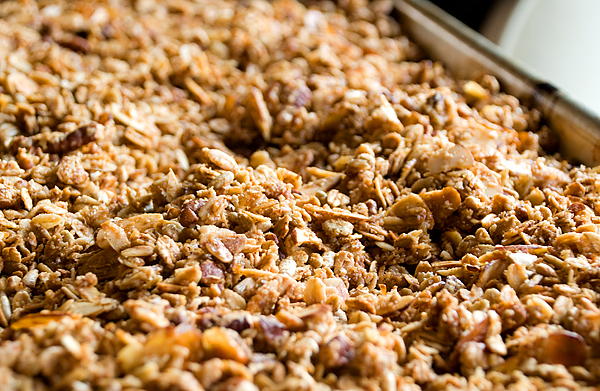 I have such a craving for granola, but I want it in bars to take along with me..
I’ll still try this recipe, can I replace the squirt of molassas for maple syrup? Yes, you can. I know that most recipies for granola bars~~you can do a google search for a recipe~~have you use corn syrup to hold the granola together, then you cut it into bars.